The annual Swan Ball returns to campus (Hunters Street) on Saturday 23rd March! Celebrate the end of the Winter Term or your time at Buckingham (if graduating) with friends, music, and laughter. Tickets are available to all current students, graduating students, alumni and staff (family members and partners welcome too) until 21 March at 23:55. There will be no ticket sales on the door. End the Term with a BANG at the annual Swan Ball! *Please note that the name you register with will be the name you need to state when collecting your ticket. If you are purchasing more than one ticket please make sure that you write your guest(s) name(s) down in the space(s) provided so that they are able to pick up their own ticket. Tickets will be issued in individual envelopes and can be collected upon arrival at the event. 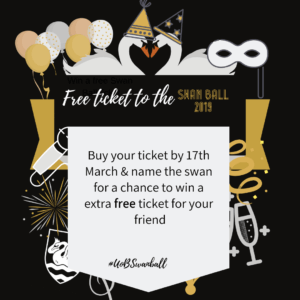 Win a free ticket to the Swan Ball for a friend! Name that Swan! The Swan is the emblem of Buckingham, but what do you think the Swan’s name should be? Enter your name for the Swan when you book a ticket for a chance to win an extra free ticket! We’ll shortlist the most fun and memorable names and put them to a public vote on social media in Graduation week. The winner of the vote will be given a free ticket to the Ball. Closing date 20th March – terms and conditions apply.